Thanks to Rochelle for shepherding the Friday Fictioneers throughout the year. I have thoroughly enjoyed posting a story almost every week, and thanks to constructive comments from some very talented writers, I feel my writing has improved a great deal. The lovely photo this week is courtesy of Jean Hays – I seem to remember having another of her beautiful stained glass panes as a previous prompt. Not long now until Christmas, only five sleeps as youngest son told me (he is 36). So, may I take this opportunity, whether you celebrate Christmas or your own particular special celebration, to wish you all peace and happiness and a wonderful holiday with friends and loved ones. Every year Jake’s parents took him to Florida for Christmas, hoping the holiday sunshine would help him. Jake didn’t react; that wasn’t unusual. Late in the afternoon on Christmas Eve, as they splashed about, a dolphin appeared alongside. Gently nudging Jake, it guided him through the water. Jake held him tightly. People stopped to watch the boy with the dolphin, seemingly playing together. She stared momentarily, not believing her ears, then hugged him. This is based on something that happened to a friend’s son. He was diagnosed with autism, a most cruel affliction, when he was two years old. He had no speech at all and although seemingly happy in all other ways, his frustration at not being able to make himself understood, gave rise to terrible temper tantrums that affected all the family. It got so bad that at times they just couldn’t take him anywhere. When he was nine, he went swimming with dolphins and a short time afterwards, he was able to speak. Not fluently, but enough to make himself understood. The medical team was very doubtful that the dolphin had anything to do with it. His mother believed that the dolphin had helped her son and I like to think so too. Thank you for that story and the story behind the story. It was very matter of fact, but sweet and hopeful all the same. A nice Christmas send off. Thank you for reading, pleased that you liked it. The back story to this is really quite humbling. It is frustrating to see the lack of help available for families struggling to cope with someone who has autism. I understand things are improving slightly, although a bit late in the day for family I mentioned. Yes, you are right, the focus always does seem to be on what new drug has been developed or is in the process of being developed. The ‘Jake’ of my story now has a dog called Ben a Labrador who follows him around and moves things out of the way so he doesn’t trip when he is running flat our around the house, as he is wont to do at times when it is too wet for them both to go outdoors. He has been back to swim again with dolphins and always seems to be happier for a long while afterwards. Have a lovey Christmas and thank you again for taking the time to read. You are correct. I posted a photo of one of Jean’s glass pieces months back. I’m sure you’ll agree that she’s an amazing artist. I’ve known her since we were young teenagers. Art is what connected us and keeps us connected to this day. What a lovely story. It’s hard to beat the ones based on fact. I’m intrigued that this prompt has inspired at least three stories this week about someone with autism. Very nicely done. 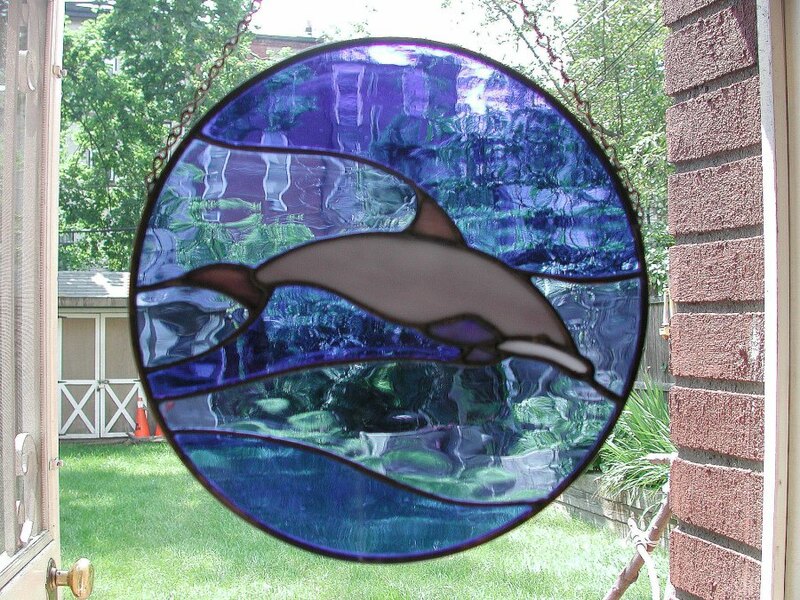 Jean is an amazing lady – the dolphin piece is just beautiful. It is lovely that you have been friends for a long time, so much shared history it’s good to have friends from way back. I’m pleased you liked my story, I didn’t think I would have time to post , but when I saw your prompt I knew the story I wanted to write. It is intriguing that autism has provided more stories this week, but then there is a lot written in the press about the relationships of dolphins and humans as well as hearing about them first hand. Have a lovely holiday Rochelle and thanks again for keeping Friday Fictioneers going each week. And like Christmas I believe also. Merry Christmas Dee, thanks for the beautiful story, it was truly a gift. Thank you Dawn. Hope you have a lovely Christmas.